As you check your pond for the effect that winter has had, be mindful that a lot of debris that has blown into the pond over the winter months is lying dormant on the bottom of the pool. Warmer temperatures will cause the debris to decay and can cause high ammonia and toxin releases. It's time to clean the pond and clean and re-start the filtration equipment. 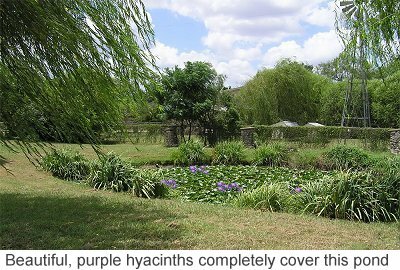 Drag or vacuum as much debris off of the bottom of the pond as possible to prevent its decay. Use bacteria enhancers to start the biological filtration process and speed the ecosystem development. Stress Zyme is a highly concentrated solution of specifically selected bacteria which will help re-start and maintain the biological filter to keep your pond naturally balanced. Over a period of several days, make a 15-25% water change to eliminate accumulated plutants. (Remember that tap water contains chlorines, cholramines, and other toxic chemicals that need to be eliminated when you add new water. API EcoFix breaks down dead algae and organic wastes. As the temperature reaches 45 degrees F, the fish will start to search for food. They are less active now than they will be in the warmer summer months. Start by feeding them small amounts of a low protein diet, gradually increasing both volume and protein content as summer and 70 degrees F approaches. After a long winter's rest, fish also need essential electrolytes - potassium, sodium, magnesium, chloride, and calcium to reduce stress, improve gill function, and help protect against nitrite toxicity. Pond Salt will provide all of these electrolytes. You may have had to bring your plants inside for the winter, or some may have died in the cold spells. Plant new ones and give them essential nutrients to get started quickly and take hold strongly. Working with plants and cleaning tools will inevitably stir up sediment, causing cloudy water conditions. Wash your pre-filter frequently to gather the suspended particles or dirt and debris so that they will fall to the bottom where you can siphon them out or where they can be sucked into the filter.